Facebook Messenger has now graduated from beta testing and its now publicly available to Facebook users for downloads. Many Facebook users are always complaint about the fb chat bug through website because sometime when user loads any fb page the chat screen goes blank and other person not able to received sent messages, but now Facebook Messenger is fee from all bugs and instability issues. Facebook users can chat with their Facebook friends from their desktop by installing Facebook Messenger Software, fb users won't have to use Facebook website for chatting purpose only now users can chat without being logged into the Social Network. Facebook Messenger requires Windows 7 to run on desktop and it will automatically syncs with Facebook, and will allow users to chat and message with their Facebook friends, and see ticker updates and notifications from messenger. According to Facebook the fb messenger currently supports chatting and messaging only with individual friends, and not group chat or video calling. The messenger comes with everything that users would expect from any messenger and contains the classic functionality needed for conversation. 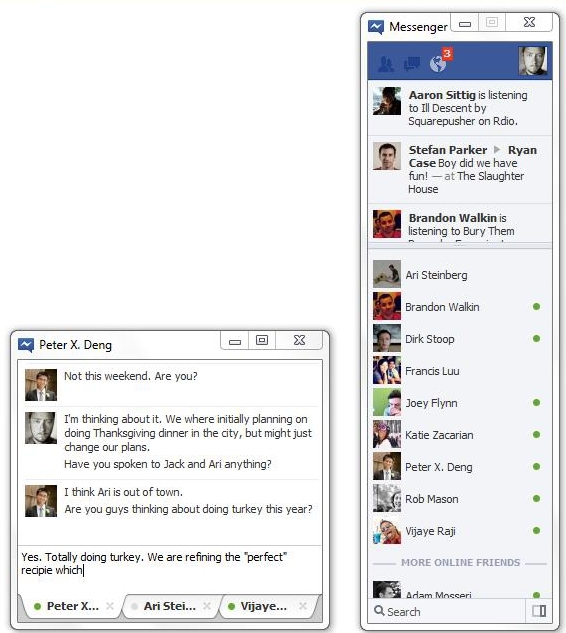 Download Facebook Messenger and start your conversation with your Facebook friends from desktop.